Find out: Is there a dam, strainers or sweepers, difficult and fast water? Do you possess the skills for the section you are paddling? If not, don’t go, increase your skills until you can. You are responsible for you! Find out the river levels and cfs (cubic feet per second) of the section you are paddling and the upstream section. Stay alert to the weather forecast in your paddle area and the upstream forecast. Be prepared for changing weather. If you are paddling whitewater and “surfing”, use a whitewater boat, as it is best to use the correct boat /size for the conditions. Check out these water applications before you go paddling. River Hazards… what to do? Low-head dam: You can be trapped in a hydraulic and unable to escape. If trapped, try to dive below the surface when the downstream current is flowing beneath the reversal. These low head dam hydraulics are called “drowning machines”. ALWAYS portage around them. High water: High water can exist when a river narrows or when recent rain has increased the current flow and depth. Consider these conditions before making the decision to paddle as an individual, even if the trip leader decides to paddle under these conditions. YOU are responsible for your own decision to make the trip. Strainer: Anything that blocks passage, but allows water to flow through. These items can be…. brush or fallen trees, bridge pilings, or undercut rocks. They can allow the river current to sweep through and can cause capsize and or pinning or can hold you under the water trapping you. Avoid these obstacles and be able to know and have the paddle skills to avoid these. Sweeper: branches hanging low over or into water that can sweep a paddler from the boat. If you get caught on an obstacle, lean toward the obstacle, typically, that is facing downstream. It allows water under your vessel to help dislodge it. Try to hold onto your boat if possible by keeping your boat in front of you, (heading down river). Never allow the boat behind you or the weight and current pushing on you can cause safety issues such as pinning , foot entrapment, broken bones, etc. Do NOT ever try to stand up in fast moving current. Stay floating on your back with your feet held high and pointed downstream and try to navigate to shore. You may need to swim at times to avoid obstacles. Other paddlers should try to help get your boat and gear for you. If you try to stand, it is possible for your foot to become trapped in an underwater obstacle causing a pinning hazard that can result in drowning. Only stand up in moving water if it is shallow (less than knee deep) or in “slow” moving water. Learn how to throw a “throw bag”, bring it on paddle trips, it could save a life. Try to catch boat floating downstream, or pull to shore if possible and remove water by bilging out or turning upside down over your kayak or on shore. PFD (Personal Flotation Device): PFD Use Saves Lives! Find one that fits well and wear it 100% of the time zipped and pulled tight. It is tight enough, when you check to make sure it can not go over your head if you pull on it. All vessels must have at least one USCG-approved Type I, II, III, or V PFD (life jacket) for each person on board. In addition to the above requirement, one Type IV (throwable) USCG-approved PFD must be on board vessels 16 feet or longer, except canoes or kayaks. All PFDs must be in good and serviceable condition. All PFDs must be readily accessible and of the proper size for the intended wearer. Sizing for PFDs is based on body weight and chest size. While underway on a recreational vessel on any Iowa waters, a child under 13 years old must wear a USCG-approved life jacket unless the child is below deck or in an enclosed cabin. Each person being towed behind a vessel on water skis, a surfboard, or similar device must wear a USCG-approved Type I, II, III, or V PFD. Inflatable PFDs are not approved for persons being towed. Each person on board a personal watercraft (PWC) must wear a USCG-approved Type I, II, III, or V PFD. Inflatable PFDs are not approved for use on PWCs. Windsurfers are not required to wear a life jacket. Inflatable life jackets are not approved for use by persons under the age of 16. Wear a helmet if you paddle Class II and above whitewater or surf waves. Pack a throw bag, paddle float and bilge pump on each trip. Wear a whistle (blowing 3 times quickly is an SOS signal). Pack an emergency kit : Stow it in your hatch for emergencies. Emergency kit supplies: first aid kit, head lamp/ flash light, matches to build a fire, snacks, water, cell phone, duct tape, and compass. Pack a dry bag of extra clothes, rain gear and an extra hat. Dress for the Weather: Be prepared; if air and/or water is cold by wearing layers (non-cotton), neoprene gloves, neoprene socks and suitable sturdy foot wear. A wet or dry suit is recommended during spring and fall paddling. 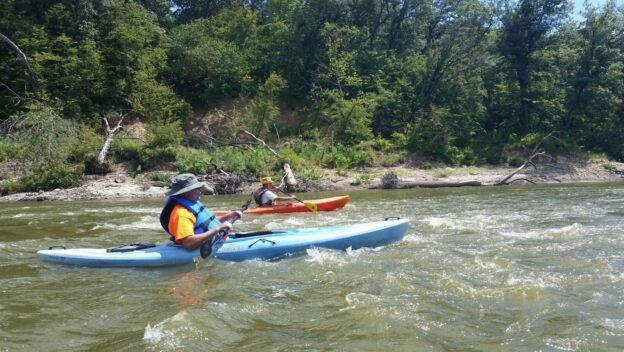 During warm weather paddling, protect arms by wearing long sleeves or by wearing sunscreen. A hat is vital for sun protection and from rain. Rule of 120: A rule of thumb for the prevention of Hypothermia. The rule is simple, just add the air temperature and the water temperature to get the combined temperature. If the combined water plus air temperature is less than 120, wet or dry suits are recommended. Hypothermia: Hypothermia is a medical emergency that occurs when your body loses heat faster than it can produce heat, causing a dangerously low body temperature. Normal body temperature is around 98.6 F (37 C). Hypothermia (hi-poe-THUR-me-uh) occurs as your body temperature falls below 95 F (35 C). When your body temperature drops, your heart, nervous system and other organs can’t work normally. Left untreated, hypothermia can eventually lead to complete failure of your heart and respiratory system and eventually to death. Hypothermia is often caused by exposure to cold weather or immersion in cold water. Suggestion: Neoprene water proof gloves and neoprene socks and /or water proof footwear can help to keep your extremities warm. Wearing a wet or dry suit can help to protect your core temp if cold water immersion happens. Alcohol Use: Do not drink and paddle. Alcohol should be avoided for safety on the water. Paddling Alone: Paddling alone should be avoided. It is wise to file a float plan by telling someone where you are paddling and when to be expected back. It is a good idea to leave a note in your car with your potential whereabouts while on the water. If less than 23.0 feet long, these vessels should exhibit a white light visible for 360° around the horizon and visible from a distance of at least one mile away if operating on natural lakes, Corps of Engineers impoundments, border rivers, or impoundments on inland rivers. If this light is partially obscured due to the nature of the vessel, an additional white light must be on hand to be shown in sufficient time to prevent a collision. Regardless of length, these vessels must have on board a white light to be used when necessary between sunset and sunrise when operated on bodies of water other than those listed above. All vessels are required to display a white light visible for 360° around the horizon whenever they are moored or anchored outside a designated mooring area between sunset and sunrise.